Graphics Embossed Images has serviced West Michigan for 45 years! On time delivery from planning to fulfillment! In today's fast-paced world, 'needing it yesterday' is becoming the norm. Give us a call...we specialize in the impossible. We're good at making YOU look good. We offer a huge selection of foils in matte, gloss, metallic, holographic, etc. We can usually get it in 24 hours. A leader in the graphics community since 1969. Got a tight deadline? Not a problem. Call us. We'll help you knock their socks off. Huge selection for all your specialty needs. 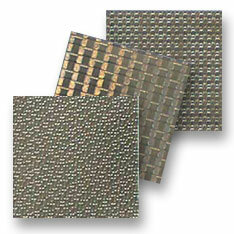 Use these on your next project: They work on any foil for a rich, textured look! "I've worked with GEI since 1988. They are my go-to supplier when I need complex foil and die-cutting needs. Michele and Ron will take good care of you."